As a functional nutritionist I want all people consuming more REAL food. We should be eating organic fruits and vegetables, a variety of proteins from animals that have lived a good life, and lots of healthy fats. We should have a balanced mentality towards treats and incorporate them without guilt. However, I am a realist. I know obtaining our caloric and macronutrient goals can be challenging in the hustle-driven culture we live in. Years ago, when I didn’t know any better, I made these huge smoothies thinking they were the best thing for me. Today, with intermittent fasting and my committment to consuming real food, smoothies and protein powders are not a part of my regular routine. If you do choose to supplement your diet with protein powders and smoothies, please heed this warning. Your body’s satiety cues come from chewing. When we drink our calories our body tends to not register this action as having eaten. This could lead to more eating throughout the day that is not necessary. I know the “healthfood product” industry game is strong, and many of my lovely clients and followers ask for recommendations regarding protein powders. Truth be told, some of these products are just crap. Sorry, but there is no other way to put it. That being said, I am breaking down my top choices. Please don’t buy the large commercially sold whey protein powders. 99% are not good for you. If you know beyond a shadow of a doubt that whey does not negatively impact your gut health and does not cause you inflammation, then I recommend Tera’s Whey. Ethically sourced whey from grass-fed cows, it’s certified gluten-free, Kosher, Lactose free and doesn’t contain rBGH/rBST. The “simply pure” variety doesn’t have any stevia and is low-carb. 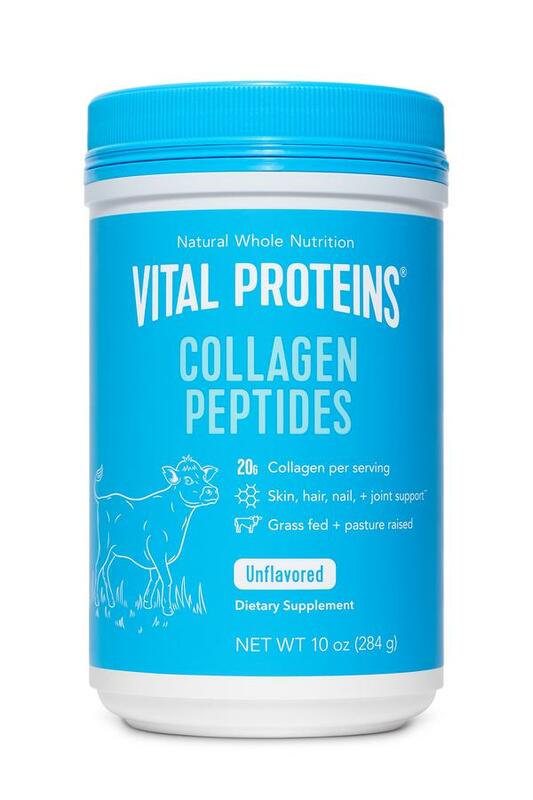 My absolute favorite animal based protein powder is Vital Proteins Collagen Peptides. Although this is not considered a “complete protein” it still provides great benefits to your gut health, skin, joints and nails. If you can tolerate beef products then you can tolerate this product. Sustainably sourced, grass-fed, pasture-raised bovines make the best collagen. The unflavored variety is super clean, digests quickly and is easily absorbed by most people. Collagen peptide runner up award goes to Bulletproof. The Bulletproof company also has an unflavored Collagen Peptide product that is high quality. Bone Broth Proteins are a newer product to the market that are an interesting option. I’m a big proponent for bone broth as it is a fantastic healer of the intestinal lining. Do we need this in protein powder form? I’m not sure. The pure product is savory in flavor and can be added to soups, stews & casseroles. It does seem to be sustainably sourced from quality ingredients. However, in this case I would prefer the use of actual bone broth. The flavored products like the Chocolate variety are going to be closer to a traditional protein powder and can be added to pancakes, made into a smoothie or oatmeal. Which leads me to thnk that this is more of a gimmick to capitalize on the bone broth craze. I looked at the ingedients in the Orgain products, the Vega products and the ALOHA products. I also browsed a few other companies that we need not mention. Personally, I am not a fan of vegan proteins. My favorite vegan product out of the list mentioned above, is the ALOHA brand. The organic protein blend from Pea, Pumpkin and Hemp seeds is a nice variety for consumption. I also like their use of actual vanilla bean for flavor and Monkfruit & Coconut sugar for sweetness instead of artificial sweeteners. Greens Powder is an option if you truly struggle to consume enough vegetables and fruits. A word of caution, adding greens powder to your smoothie does not replace your need for consuming vegetables. You need to eat your greens! As with my other recommendations please search for high-quality organic ingredients. ora Organics contains a very well balanced list of assorted greens to help alkalinize your body. I like how clean it is. The truth is, I haven’t actually tried this product so let me know in the comments if you have. As a reminder, I urge you to chew your food and consume organic well-balanced meals. Each meal should have a healthy fat, quality protein and assorted starchy vegetables for carbohydrates and fiber. If you must incorporate a protein supplement, do look for a very clean ingredient list and organic if possible. Additionally, the grams of protein you consume does not need to be a 1:1 ratio of body weight. If you are not a body builder or Olympic athlete your protein needs are much lower. Share with me your experiences with protein powders! In my opinion many products either taste horrible or are filled with chemically derived ingredients. Let me know your favorites or worst experiences!